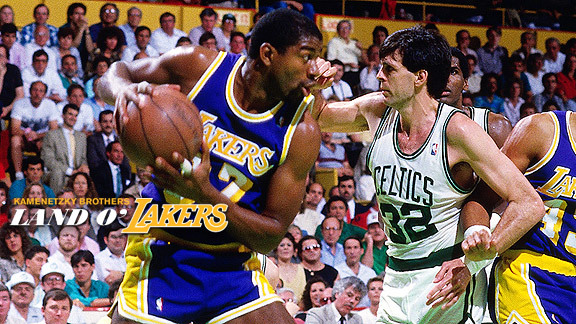 The Celtics may have imagined a hook shot beating them in Game 4 of the '87 Finals... but likely not from Magic Johnson. You can probably still hear the call from Chick Hearn. Up two games to one against the Boston Celtics in the NBA Finals, the Lakers trailed 106-105 in Game 4 at the Garden with only seven seconds remaining. Kareem Abdul-Jabbar had just missed the second of two free throws, but Mychal Thompson knocked the rebound from the hands of, as Hearn put it, "a crying Kevin McHale." L.A. would have one more shot to win. "Cooper takes the ball out of bounds, baseline. Kareem and Worthy to the left. Worthy comes right, to the left goes Magic..."
Magic came off a screen from the Captain in the lane, breaking to the left corner along the baseline. Cooper fed him the pass. He faced up, and for a moment it looked like he would take the jumper. Instead, he sees McHale set to defend him. "Didn't shoot it. Five seconds left..."
Magic dribbled aggressively with the right hand towards the paint. He was too quick for McHale, who fell behind Johnson, lagging near his left hip. Magic's last step brought him below the free throw line, his right leg rising as he planted on the left. "Magic down the middle, just what I thought. A hook shot at 12..."
In 1980 as a rookie, Magic jumped center for an injured Abdul-Jabbar in one of the league's most iconic moments. Now, Johnson seemed to channel the venerable center as he flowed to the basket and let the shot fly. "Good! The Lakers take the lead on Magic Johnson's running sky hook!" The Celtics had one more chance to win, as Larry Bird had an impossibly open look at the Lakers' basket from the left corner, but his shot was a hair too long. The Lakers had a 3-1 lead in the series, and would go on to win in six. Magic's shot was the iconic moment from the last of L.A.'s great series against Boston from the 80's, the one putting him a ring ahead of Bird in head-to-head competition. -Kareem's sky hook marks the end of Boston's dominance over L.A.